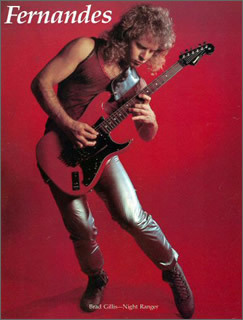 This signature guitar for Brad Gillis of Nightranger was built in 1985/6 and in only in very limited numbers. Today it is pretty difficult to find one. It was built in Fernandes’ custom shop, and I have to confess, one of my favourite guitars. I badly want one of these! It comes with Fernandes Floyd Rose Licensed “Head Crasher” Tremolo, which works very fine. The real gimmick with this guitar is a preamp power booster system. For this the Brad Gillis model provides a second plug for the booster. The neck is painted. It comes with 2 single coil and 1 humbucker, all of which are very high output and are absolute power strat like. This model features the Brad Gillis signature on the headstock.